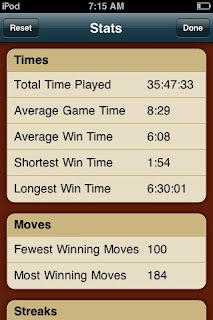 Smallware's Solitaire app for the iPhone/iPod touch is a slick little app for passing the time on the commute. Yesterday I beat my previous record time of 2:11 with 1:54 as shown in the screenshot. Also shown in the screenshot is what I consider to be a bug. If you put your iPhone/touch to sleep with the game as the active app, the timer doesn't stop, which is how I ended up with a longest winning time of 6:30:01. But other than that, it's a fine way to kill time on the train.